This is a fashion plate or magazine illustration showing the latest fashion. It is a lithograph and was issued hand-coloured. 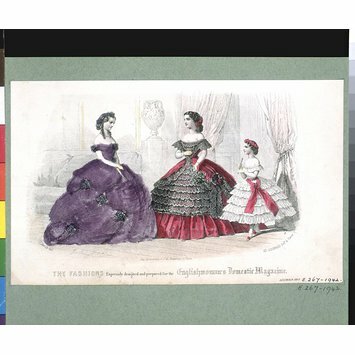 In 1860 the publisher of this magazine, Samuel Beeton (husband of the celebrated cookery writer Mrs Beeton), first began including hand-coloured fashion plates by Jules David. Beeton also included paper patterns, a new phenomenon that, combined with the fashion plates, ensured the magazine a particular appeal among the increasing numbers of owners of the domestic sewing machine. The sewing machine itself had only become widely available since the late 1850s. This magazine's wide distribution ensured an awareness of French fashions among a wider section of society. Jules David was a painter, book illustrator and lithographer, and was well known for his fashion plates. About 2,600 of these were published in the Moniteur de la Mode and then subsequently used in other magazines, in France, Germany, Britain, Spain and America. David was also the first to introduce the use of contemporary backgrounds into fashion plates. 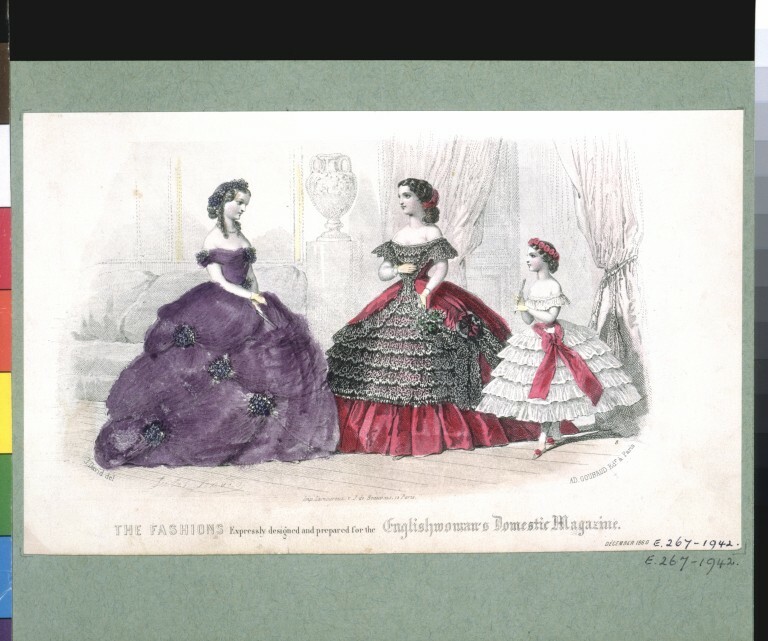 This fashion plate shows examples of ball dresses. France dominated the world of fashion during this period and French fashion plates were an important source of information on the latest styles and colours. The dresses have fashionable wide skirts, reflecting the contemporary popularity of crinolines. Introduced in 1856, and generally made of hoops of spring steel suspended on strips of material, these allowed skirts to expand to enormous proportions not possible with layers of petticoats.